A 240 sq.m spectacular sunset view villa located in a 2.000 sq.m lot. It comprises of five beautiful double bedrooms, and four bathrooms that may accommodate 10 persons. All bedrooms are fitted with TV and air-conditioning. The living room and kitchen are located on the ground floor and with direct access to the pool and terrace. Just outside of the living room and kitchen, there is a Swimming pool, and an amazing sun covered and wind protected 500 sq/m terrace. It is furnished with three built in sofas and two built in dinning tables for twelve and eight persons respectively. There is also a large bar fully equipped with a sink, a fridge, and stools. Other amenities include sun shaded sun-beds, integrated sound system, dimmer controlled lighting, wi-fi internet access, two (2) BBQ's, (one with coal and one with gas) and of course a traditional open-air wood stove. The villa is fully furnished and household equipped, with a lovely view of the Aegean Sea providing unforgettable sunsets. We cannot say enough nice things about Maria's villa. 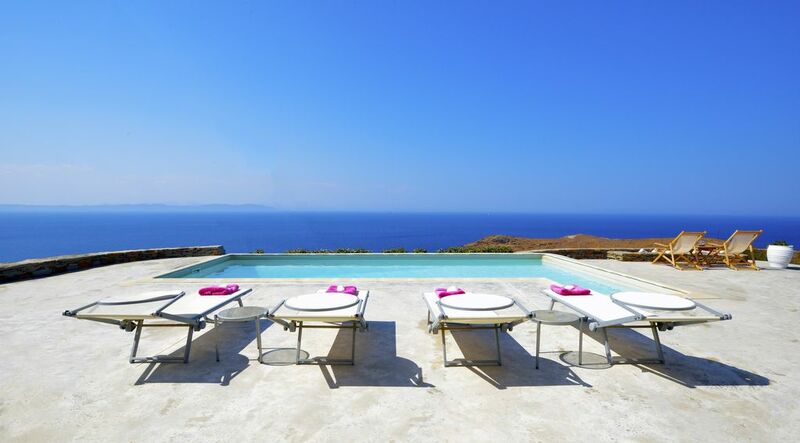 We were two families that stayed there recently and it was really a dream Greek villa experience. Maria is thoughtful and responsive host and her housekeeper, Mona, is equally terrific. Mona is a wonderful cook and resource and we enjoyed a few means on premises. The house itself is immaculately maintained with lots of thoughtful features for travelers like multiple beach towels, high end sun loungers, candles to light at night for a sense of warmth and coziness. It is important to note that the house is a bit out of the way not in distance but there is winding dirt road and we were glad to have a rental Jeep. We also did not venture out much at night since there are steep drops and virtually no street lighting on most of the road into town. Having said that, we really felt no need to leave the Villa at night and enjoyed games and adventures in the wonderful covered terrace and swims in the gorgeous pool. Big thanks to Maria for making our dream Greek vacation possible! Thank you so much Jesper, for your kind words.I am really happy you enjoyed your stay at the villa. I wish to you,and your family all the best,and perhaps will meet again in the future. The villa and the view is stunning - far more than a 180degrees more like a 220 degree view of the crystal Blue sea, islands and the most spectacular sunset every night. Amazing roll down blinds in the superb outdoor eating area mean that you are sheltered from the Meltemi winds if they come and have enough space for at least 12 round the amazing table - we ate from the outdoor BBQ over 50% of the time. We stay at villas on various Greek islands every year for the last 11 years and this is the best layout and view we have experienced so far. The villa has everything you will need and more and is kept clean and tidy by the cleaner who comes every few days. As I am sure Maria will tell you a car is a necessity as its a few minute drive to the town. Maria is amazingly helpful and responsive via phone and email and within no time you will be able to relax into the REAL Greece or the "Secret Seaside" of Kea as the Daily Telegraph refers to it- free from "English Breakfasts" and Tourist traps. I really hope to see you,and your lovely family again soon!! We had rented the house to celebrate a 50th Birthday together with our 3 couples of friends. The house was perfect for this, or could have been for families. The outdoor area is truly suberb, with brilliant views and a lovely swimming pool. Small secluded beaches close by, and fun to explore the island. Imperative to have a car to get around. Really excellent! I wish you,and your husband,all the well. The villa and the view is truly spectacular. I m giving a 4 out of five because i hope to find a better place one day... The place is fantastic and the area outside the house next to the good size pool is like a balcony overlooking the Greek archipelago. The villa is well equipped with all the necessary items and more. There is a great sandy beach 3,5 kms to the southwest of the house. Also nice rocky bays within 400 metres. The owner Mirka is very gentle and honest. Our stay at the villa was wonderful--an oasis of calm and beauty to return to after a day hiking on the trails of Kea or exploring the nearby villages. Some days we simply stayed home by the pool, reading and sunbathing, and taking in the vast views of water and sky. The house itself is gorgeous--even more appealing than the pictures show. Impeccably maintained and beautifully decorated, while still relaxed and casual. Maria was the consummate helpful host. She met us at the boat, showed us everything we needed to know about the house, recommended things to do and places to eat, and responded to all our questions quickly and helpfully. Our ten days sped by, and we wished we could have doubled them. Margaret and family,were very kind,and the perfect guests. their own.I hope that all my guest will be like them. The villa is beautiful, everything seems to fit nicely inside out, the space outside the villa and the pool is just great makes you feel like you live at a balcony over the Greek archipelago!. The sunset gorgeous. Its very quiet and safe. Mirka is very helpfull and honest. Many thanks Elisavet and Yiannis,it was a pleasure,hosting you,to my house. Kea is part of the Cyclades island group in the Aegean Sea, southeast of mainland Greece and a former administrative prefecture of Greece. It is accessible by ferry from the port of Lavrio, which is less than 30 km from Athens International Airport. The villa is located at the area of Melissaki and is only 2,5 km from Korissia, the main port, and 6 km from Vourkari, the port where where mainly motor and sailing boats are harbored. Ioulis or Ioulida, the island capital is just a 15 minute drive from the villa. While popular with both tourists and Athenians, is relatively unspoiled in that cars must be left at the entrance of the town, and "life is pretty much the way it has always been". High quality traditional coffee shops and restaurants may be found. In a distance of 2,5 Km all kind of facilities are available i.e. Banks, restaurants, Bars, Coffee shops, Pharmacy, Super Market, Butcher shop, Bakery, Shops, Discotheques, Beaches etc. Melissaki is a small pebbled, non organised beach ideal to relax. Although it is close to Korissia, very few know about it. Xila is one of the best beaches of the island. It is sandy and partly organised. Sun-beds and umbrellas are available. Although nearby the ports and capital, it is not crowded and gives the impression of it being remote. The long and sandy beach of Korissia is located within a walking distance from the port. It is organized with sunbeds, umbrellas, beach bars. Gialiskari is among the most popular beaches of Kea. It is a sandy bay with clean water and a fine all day beach coffe-bar and restaurant right on the water front.